This spacious energy efficient walkout, fully finished bungalow, has spectacular mountain and countryside views. The home is constructed with passive solar heating and solid concrete ICF (Insulated Concrete Form) foundation, floor to ceiling, including the suspended slab on the main floor. The hot water in floor heating system extends into the massive attached double garage as well as the entire upper and lower levels of the home. Triple pane windows, on the west side of the home, add to the energy efficiency, offering the amazing views of the world famous Canadian Rocky Mountains. 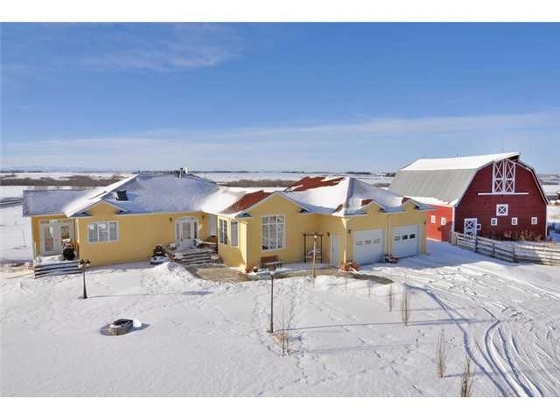 The acreage includes a large, solid, 50'x37' character barn with spacious hay loft. This is the perfect opportunity for a small horse facility, with agricultural zoning it provides endless possibilities. There is also potential for a 2.1 acreage subdivision. Commute easily to Downtown Calgary by car or Commuter Bus in 60 minutes! This acreage is a unique invitation to rural living.